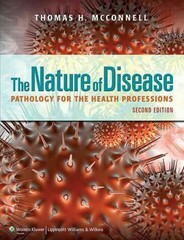 The Nature of Disease: Pathology for the Health Professions 2 Edition Easy to understand and fun to read, this, this engaging primer on the etiology and pathogenesis of human disease will help you develop a basic understanding of pathology that will set you on the path to a successful career in the health professions. Punctuated by humor, unique case studies that link pathology to real-world clinical applications, and absorbing tales from the history of medicine, this engaging book focuses on the patient as it guides you through the causes and consequences of common diseases. Written throughout to help you succeed in the course, this book will help you: Read with purpose using Chapter Outlines that provide a handy chapter roadmap and Learning Objectives that alert you to specific material you need to master. Develop clinical insight as you explore each chapter‘s opening real world Case Study (which include chief complaint, clinical history, physical examination, and clinical course) and chapter-ending Case Study Revisited, takes a second look at the case through the lens of the information presented in the chapter. . Fine tune your understanding of specific human disorders with full color illustrations and photographs that clarify key points. Learn the key "rules" that determine why disease occurs and why it unfolds the way it does, with bulleted lists that summarize major disease determinants. Develop insights into the patient side of disorders through The Clinical Side boxes. Build your understanding of the molecular level of disease through easy-to-grasp discussions of simple molecular mechanisms in Molecular Medicine boxes. Increase your mastery of essential points using the brief callouts in Case Notes, Pop Quiz questions and Remember This! features. Evaluate your mastery of key topics with chapter-ending Chapter Challenge questions.